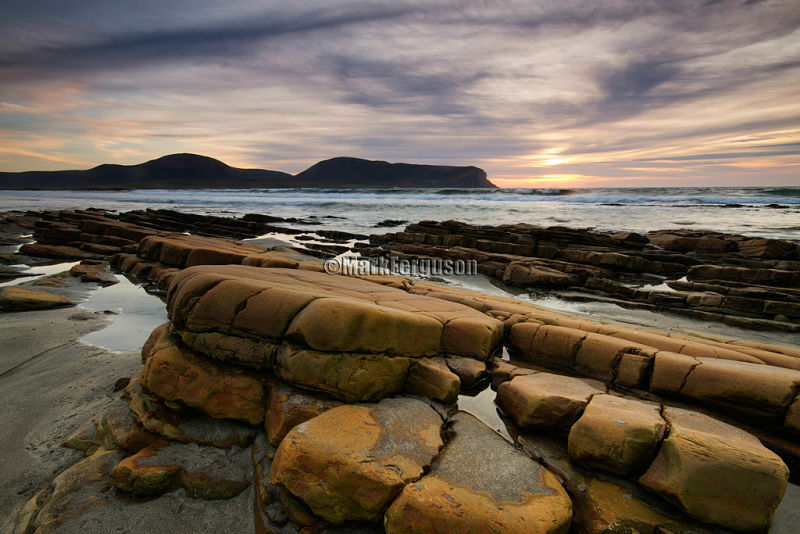 The mainland of Orkney may not be renowned for its sandy beaches; but I believe its rocky shores and rugged cliffs provide the photographer with great opportunities for capturing dramatic coastal images, especially during the winter months. The rocky beach at Warebeth, just north of Stromness, has become one of my favourite coastal locations in Orkney. Its dramatic setting facing the hills and cliffs of Hoy combines with the foreground interest provided by its sandy and rocky foreshores to create much potential for the landscape photographer. During the winter months, the sun sets on the horizon just to the north of the Kame of Hoy, offering the possibility of some truly dramatic sunset images. It was in the hope of capturing the beauty of such a winter sunset that I decided one bright, dry afternoon in November to cycle to Warebeth on my mountain bike – photographic kit in panniers and tripod on rack. I had planned my trip to coincide with a low tide – which would reveal the rocks – and a setting sun, thus increasing my chances of capturing a successful image. My plan was to capture some blurred-water shots against the setting sun. However, as I approached Stromness, high clouds were beginning to obscure the western sky, and so I wasn’t optimistic about my chances of success. Slightly downhearted, I continued to Warebeth and surveyed the beach for potential spots to set up my tripod. As I approached the water's edge, I felt fine sea-spray in the air and so quickly abandoned the idea of any blurred-water shots, as spray would prove difficult to wipe off the lens. Furthermore, the sun was losing its intensity and becoming more watery behind the clouds – again forcing me to rethink my plans. Heading back up the rocky shore, I noticed some very distinctive and colourful rocks and decided to try to capture these in my composition. As I looked back towards the sea, I was inspired to use the Hoy mountains as my focal point and the rocks as foreground interest to lead the eye into the shot. It wasn't long before I found some colourful, almost prehistoric, sandstone rocks, which extended towards the shoreline, and was able to proceed to set up my tripod and perfect my composition. Once settled on a composition I was happy with, I set up the camera to use Live View and checked my histogram. It was clear that, although the sun was now almost obscured by thick high cloud, I would have to use a neutral density grad filter to balance the exposure of the sky with the foreground. I decided on a 2-stop, neutral density hard grad together with a 2-stop, neutral density filter to slow the shutter sufficiently to achieve a pleasing blurred-water effect near the shore. My final settings were an iso 100, f16, 0.25 sec on my Canon 7D, with 10-20mm lens set at 11mm and focussed approximately 2m away to keep front-to-back sharpness. Even though I was not at the water's edge, I still had to wipe some spray off the filters periodically, and, because of this, I made numerous exposures in the hope that I would capture at least one satisfactory image. Reasonably happy that I had captured a decent, well-exposed image, I cycled the 10 miles back to my home. I often travel by bike to photo locations, as I believe the benefits of improved health and cheap travel alleviate the pressure of having to return with usable shots each time I go out. As I live in the centre of mainland Orkney, most of my preferred locations are no more than 20 miles away and so I can plan to use the bike for most trips. Post-processing in Photoshop was minimal – just a few slight tweaks using Curves and the Dodge and Burn tool. I was pleased with the final image, as I believe it shows how atmospheric this location can be, given the right conditions.